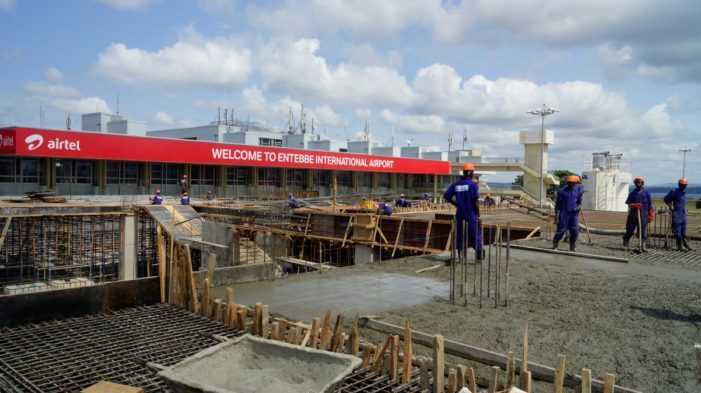 ENTEBBE – The first phase of expansion works at Entebbe International Airport is on schedule and is expected to be completed in May 2021. The Civil Aviation Authority (CAA) board chairman, Mr Edward Mike Ndawula, said the works have reached 45 percent completion. “We have quite a number of projects on the expansion of the airport and we are on schedule, the first phase of the expansion will be complete in May 2021,” he said. Mr Ndawula made the remarks after taking the journalists on a tour of the ongoing works at the departure, and arrival terminals, fuel farm, runways, cargo area and taxiways. “As the first phase gets complete the 12-30 runway at the old airport will not have lights in the first phase because aeroplanes that are only in class c (160 passenger carriers) will be landing here during daytime. The electricity poles will be erected in the second phase of the expansion,” he said. Mr Ndawula said there is an institutionalized progress committee meeting that looks at the projects that are ongoing every month to ensure works are completed on time. The supervising consultant of the expansion works, Mr Mark Donald of Dar Al – Handasah Shair & Partners, said the 12:30 runway at the old Entebbe airport will be available for daytime operations for small planes as works on the main runway at the new airport commence. “We think our windows on the main runway will be between 6 o’clock in the morning and 12 noon every day and during that period the aeroplanes coming could land on this runway as long as it’s a small aircraft,” he said. He said they will have to limit work on the main runway at one o’clock to allow bigger aircrafts come in and land on the runway. The upgrade and expansion works for Entebbe International Airport are set to be carried out in three phases through to 2034. The first phase’s groundbreaking ceremony was held in August 2015, while the construction of the new cargo building began in May 2016. CAA received approval from the Parliament of Uganda to secure $200m of loan from the Export-Import Bank of China for phase one of the project in July 2015. The second phase of works will be carried out from 2019 to 2023 at an estimated cost of $120m, while the final phase will begin in 2024 and conclude in 2034 via an investment of roughly $160m.